December Book Club: Path of Perfection ~ The Toronto Hare Krishna Temple! 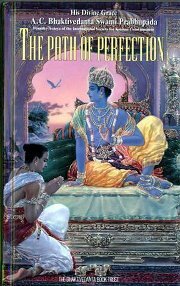 The newly established "Toronto Hare Krishna Book Club" will be reading Path of Perfection this December. This book has 176 pages, so if you were to read only 6 pages a day, you will complete the book in less than a month! "A chronicle of a historic series of talks by Srila Prabhupada, who has been acclaimed by scholars as the greatest exponent of the Indian spiritual tradition, this book deeply probes the nature of consciousness, meditation, karma, death and reincarnation. He prescribes a simple process to purify the mind and elevate the consciousness - a process that assures the readers not only inner peace but the power to change the chaotic trend of modern society." The objective of the book club is to facilitate and encourage readings from the wonderful philosophy of Krishna consciousness. We encourage you to participate! We will be sending out daily quotes from the book to those who register! To register for the book club, email toronto.sankirtan@gmail.com.